Mogadishu (HAN) 12th March, 2014 – The Somalia Prime Minister was accompanied by some members of his Cabinet to meet with some members of the international community based in Mogadishu; the UN Special Representative for Somalia, Ambassador to Britain, Ambassador to Turkey, United Arab Emirates and other International Organizations. 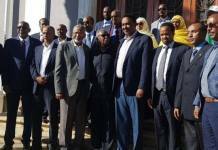 The meeting focused on the Somali Government’s emergency plan to deliver the people of the regions recently liberated from the anti-peace group of Al-Shabab and to implement the area of ​​social services, basic security and local administrations. 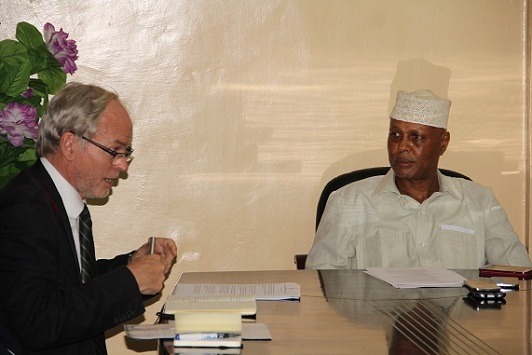 “I talked to members of the international community to take part in the government’s rescue plan for extending the Somali people in the areas of anti-peace groups war against Al-Shabaab. The liberated zones, Government We will deliver water, food, basic services and education, while waiting to permanently secure the security of the liberated areas. “Said Prime Minister Abdiwali Sheikh Ahmed. The Prime Minister added that the government will put more effort into the re-building after the implementation of the areas of security and stand alongside the Somali crisis group to upperhend anti-peace elements and conspirators. The HAN & Geeska Afrika Online reporter said, Members of International community who attended the meeting said they will participate in the emergency plan of the Somali governments leading role to help Somali people. Ambassador to Turkey was sitting in the meeting he mentions his Stand About his government to resume their combined cash budget support to the new Somali Government.